If you don't see any Pepsi commercials tomorrow on the Superbowl, I'm here to tell you where all that money is going instead: on making the world a better place. That's right. Pepsi is set to spend more than $20 million this year to benefit causes proposed by the public in the areas of health, arts and culture, the environment and education. And you are invited to submit your ideas to the and then get out the vote for your ideas. Ideas can be submitted to the Pepsi Refresh Project once a month from the 1st to the 15th, or until the contest receives 1000 ideas. Then you rustle up all of your fans from Facebook, Twitter, and other social networking sites, plus the friends who just own a computer, and ask them to consider voting for your idea. Fans get to vote the month after you submit your ideas; say March for the ideas you submitted in February, and by the end of that March, the winners for February will be announced. There will be several grants awarded each month. Think of a way you can change things for the better. The idea can be related to Health, Arts and Culture, Food and Shelter, The Planet, or Neighborhoods. Then figure out how much it will cost to make your idea happen - $5,000, $25,000, $50,000 and $250,000 are the available grant amounts. 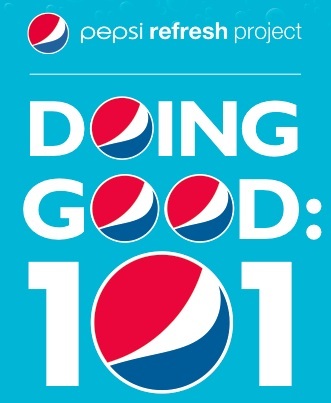 When you've fleshed out your idea, you're ready to submit your application to the Pepsi Refresh Project. It's right here on this PDF. No sooner did I write this, that I learned that the month of February has already closed for applications. But don't dismay, start getting ready for March. And in the meantime, don't forget to vote for an idea submitted in January! Because your inline advertising is too distracting. In your 12pack and 24 pack of soda I would like for you to mix half and half. Half of the soda that go together. Please contact me with more deal tails.